With regard to termination of ethernet shielding I have been taught always to terminate only ONE end of the shielding to ground to prevent ground loops occurring. and is there any other way of terminating the shield? 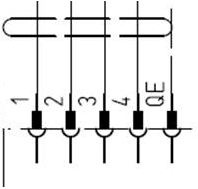 Finally.. and I'm sorry for the list of questions but the way I look at this schematic symbol is that the shield connects to pin QE. Is this what others think too? If a shielded cable is NOT grounded at both ends, H fields are attenuated by LPF and E fields are amplified by HPF effect. There can be real problem grounding any conductor including shields between two units operating off of two power mains in or between buildings. Ground potential differences can be kilovolts during lightning strikes. Ethernet has common mode in-line isolation rated at 1.5kV rms per IEEE 802.3. The shield is not the issue; Engineers’ knowledge of ground potentials, isolation, and shielding is the issue. Floating one end of the shield only makes the problem worse. Isolation units can be inserted to solve most problems, if high AC ground current exists, or if interbuilding lightning is a risk in high strike areas such as Florida during hurricane season. (100 flashes/s in a 30km radius.) Then building grounds must be improved. a series plastic Y2 Cap that is high impedance at 50/60 Hz but low Z, ESR are 100KHz is a possible solution if inter-building ground fault currents are large. Then any metallic exposed grounds must be insulated >3kV rating. The PHY of the ethernet has an effective high CMRR balun but may not be enough if RF noise couples to an open ended shield with 1/4 wave effects and high E field coupling. The shield is supposed to be grounded at both ends. When I am using the industrial ethernet, the sockets are metalized, and the connectors are metalic. So the shield is clamped on the connector casing and this goes directly into the socket, therefore this equals to the conection of the shield at both ends. The using of FTP cable implies also using of metal connectors and sockets, so IMO nobody connects shileding separately. When using patch pannels, then the shilding is also connected on the casing - both ends. Not the answer you're looking for? Browse other questions tagged ethernet cables emc data shielding or ask your own question. Should I connect a cable's shield to the ground layer of board when it's isolated from earth?